Hail, Mary, full of grace, the Lord is with you; blessed are you among women, and blessed is the fruit of your womb, Jesus. Holy Mary, Mother of God, pray for us sinners, now and at the hour of our death. Amen. O my God, I love you above all things, with my whole heart and soul, because you are all‑good and worthy of all love. I love my neighbor as myself for the love of you. I forgive all who have injured me and ask pardon of all whom I have injured. Angel of God, my guardian dear, to whom God’s love commits me here, ever this day (night) be at my side, to light and guard, to rule and guide. Amen. Hail Mary . . .
Pour forth we beseech you, O Lord, your grace into our hearts, that we, to whom the Incarnation of Christ, your Son, was made known by the message of an angel, may by his Passion and Cross be brought to the glory of his Resurrection, through the same Christ our Lord. O God who gave joy to the world through the Resurrection of your Son, our Lord Jesus Christ, grant, we beseech you, that through the intercession of the Virgin Mary, his Mother, we may obtain the joys of everlasting life, through the same Christ our Lord. V. Come, O Holy Spirit, fill the hearts of your faithful and enkindle in them the fire of your love. Send forth your Spirit, and they shall be created. O God, who has taught the hearts of the faithful by the light of the Holy Spirit, grant that by the gift of the same Spirit we may be always truly wise and ever rejoice in his consolation. Through Christ our Lord. R. And let perpetual light shine upon them (him / her). V. May they (he / she) rest in peace. V. May their (his / her) soul(s) and the souls of all the faithful departed, through the mercy of God, rest in peace. Bless us, O Lord, and these your gifts, which we are about to receive from your bounty, through Christ our Lord. Amen. We give you thanks, almighty God, for all your benefits, who live and reign forever and ever. [And may the souls of the faithful departed, through the mercy of God, rest in peace.] Amen. I believe in God, the Father almighty, Creator of Heaven and earth. I believe in Jesus Christ, his only Son, our Lord. He was conceived by the power of the Holy Spirit and born of the Virgin Mary. He suffered under Pontius Pilate, was crucified, died, and was buried. He descended into Hell. On the third day he rose again. He ascended into Heaven, and is seated at the right hand of the Father. He will come again to judge the living and the dead. 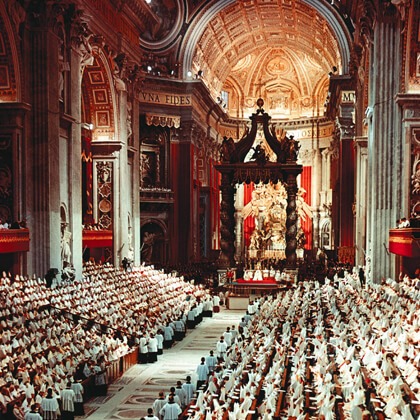 I believe in the Holy Spirit, the holy Catholic Church, the communion of saints, the forgiveness of sins, the resurrection of the body, and life everlasting. Amen. O my Jesus, forgive us our sins, save us from the fire of Hell, draw all souls to Heaven, especially those who are in most need of your mercy. Amen. Hail, holy Queen, Mother of mercy, our life, our sweetness, and our hope. To you do we cry, poor banished children of Eve. To you do we send up our sighs, mourning and weeping in this valley of tears. Turn then, most gracious Advocate, your eyes of mercy towards us, and after this exile show unto us the blessed fruit of your womb, Jesus. O clement, O loving, O sweet Virgin Mary. O God, whose Only‑Begotten Son, by his Life, Death, and Resurrection, has purchased for us the rewards of eternal life; grant, we beseech you, that we, who meditate on these mysteries of the most holy Rosary of the Blessed Virgin Mary, may imitate what they contain, and obtain what they promise. Through Christ our Lord. Amen. O my God, I am heartily sorry for having offended you, and I detest all my sins, because I dread the loss of Heaven and the pains of Hell; but most of all because they offend you, my God, who are all‑good and deserving of all of my love. I firmly resolve, with the help of your grace, to confess my sins, to do penance, and to amend my life. Amen. Saint Michael the archangel, defend us in battle; be our defense against the wickedness and snares of the Devil. May God rebuke him, we humbly pray. And do you, O prince of the heavenly host, by the power of God thrust into Hell Satan and all the evil spirits who prowl about the world for the ruin of souls. Amen. Holding the Crucifix in your hand, make the Sign of the Cross and pray the Apostles’ Creed. On the first bead after the Crucifix, pray the Our Father. Pray one Hail Mary on each of the next three beads, asking God to increase faith, hope, and charity in your life. On the bead after these three, pray the Glory Be, announce the First Mystery, and pray the Our Father. 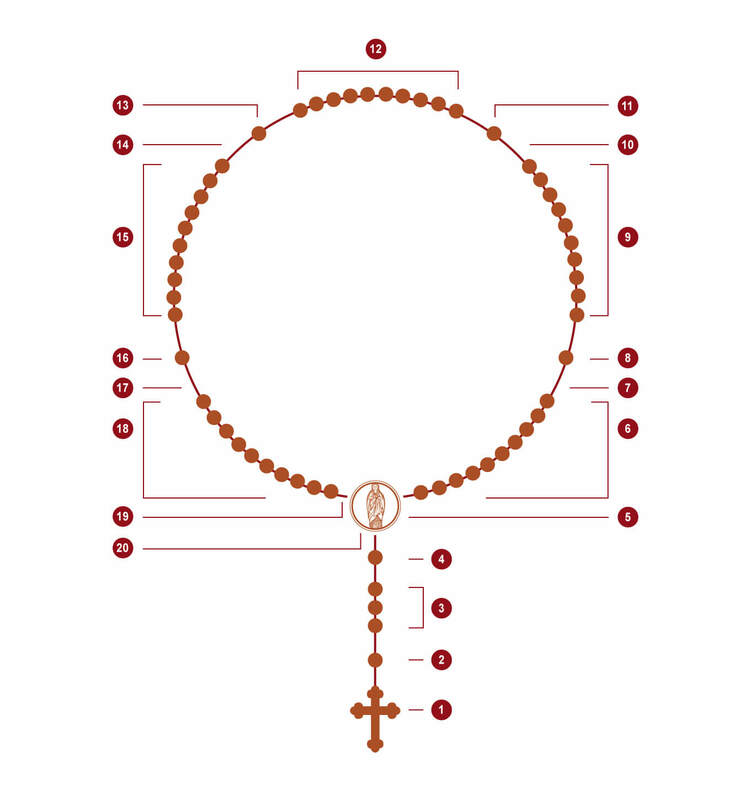 Pray one Hail Mary for each of the ten following beads, and end them by praying the Glory Be and the Fatima Prayer. Announce the Second Mystery and repeat steps four and five. Do the same for the Third, Fourth, and Fifth Mysteries. After the Fatima Prayer for the Fifth Mystery, pray the Hail Holy Queen, the Rosary Prayer, and end with the Sign of the Cross. This version of the Stations of the Cross was celebrated by Saint John Paul II on Good Friday, 1991.